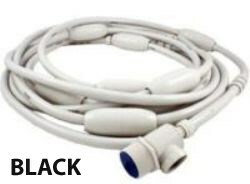 This feed hose complete is designed to use with Zodiac Polaris Black Max pool cleaner models 280, 380 and also compatible with Zodiac Polaris Black Max pool cleaner models 280 Vac-Sweep, 380 Vac-Sweep. UWF included, no back-up valve. Black color.